The opening ceremony for the 56th World Cup of Golf was held at the Mission Hills Golf Club on Hainan Island, China. Italian brothers Edoardo and Francesco Molinari will be aiming to defend their title won at Mission Hills in 2009. The event is now being held every other year in order to accommodate golf’s debut at the 2016 Olympics in Rio de Janeiro, Brazil. The 28, two-man teams include Ireland’s world number two Rory McIlroy along with Graeme McDowell who finished a shot behind the Italians in 2009. Other players from the world top ten included Germany’s Martin Kaymer (four) and American Matt Kuchar (10). Sharing the spotlight with major winners Charl Schwartzel, Louis Oosthuizen, McDowell and McIlroy will be the Guatemalan team of Pablo Acuna and Jose Toledo, who clinched the last available spot with a birdie at the closing hole of the South American qualifier. The competition, which was first played in 1953 and was known then as the Canada Cup, has traditionally brought together golfers from widely differing countries. "The diversity of this field is a testament to the vision of John J Hopkins, the founding father of the World Cup," said George O’Grady, the chief executive of the PGA European Tour, at the opening ceremony. 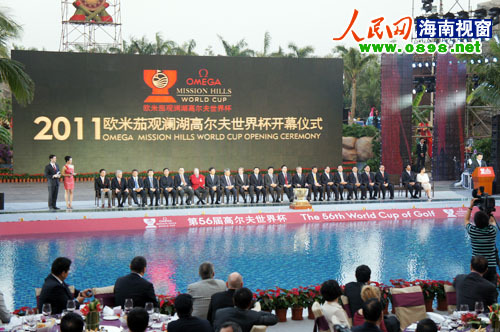 "We are confident that this 56th Omega Mission Hills World Cup will be instrumental in the continuing development of the game of golf in China and the perpetuation of the events overriding purpose – international goodwill through golf," added Jonathan Linen, the chairman of the board of the International Golf Association that organise the World Cup. The competition consists of two days of four-ball play where only the best score by each player of the team counts and two days of foursomes where the team play just one ball and take alternate shots.